It's Facebook Fridays! for May 25, 2018, and YOU can learn how to foretell the future with stones, crystals, and coins! The Lucky Mojo Curio Company is holding a random drawing to give away 4 Lithomantic spiritual supply prizes to open a new realm of fortune telling and magic. 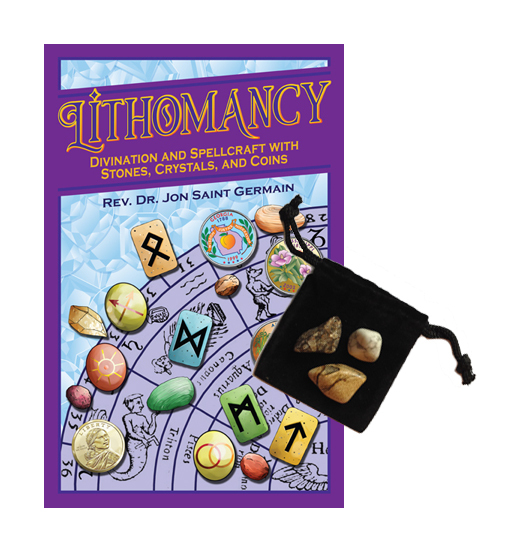 This week each lucky winner will receive a copy of Jon Saint Germain's brand new book, "Lithomancy: Divination and Spellcraft with Stones, Crystals, and Coins;" along with the Basic 3-Stone Stone-Casting Set described in the book, so you can practice your newly acquired knowledge. First thing tomorrow morning, we will select FOUR winners at random, announce their names here, and ask them to message this Facebook Page with their mailing addresses, so we can send them their FREE Lithomantic products. We have a winner! In fact, we have 4 lucky winners! Our We have a winner! In fact, we have 4 lucky winners! Our Facebook Fridays! winners for May 25, 2018 are: Charlotte Tate, Jennifer Raymond, Stella Waldvogel, and Chantal Quake.